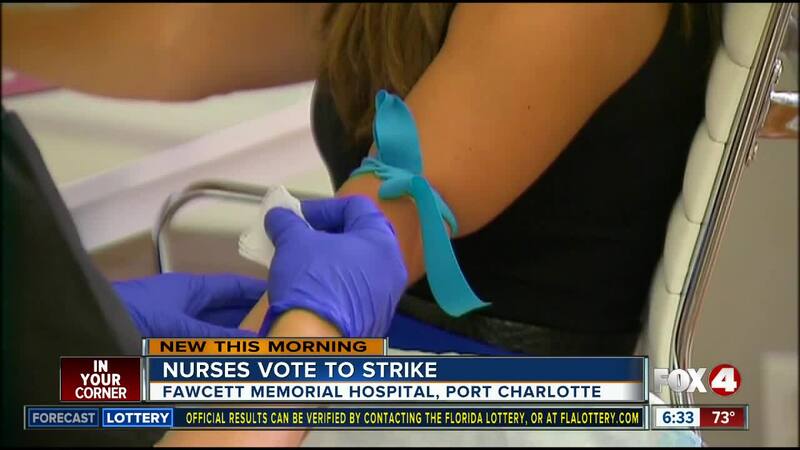 PORT CHARLOTTE, Fla. -- According to National Nurses United , 7,000 registered nurses at 15 HCA-Affiliated hospitals across the country voted to authorize a strike if the issues they're facing do not get resolved soon. Nurses from Florida, Missouri, Kansas, Texas and Nevada voted to authorize their negotiators to begin a strike if issues with high turnover rates, scheduling, recruitment, and retention of quality nurses continue. Nurses at Fawcett Memorial Hospital in Port Charlotte could participate in the strike, if it occurs. The hospital currently has 20 open nursing positions. But according to nurses, if they move forward, they will provide hospital management 10 days notice. This will allow hospital staff the opportunity to prepare for the shortage of nurse staff.